You've seen them before - the group of giggling girlfriends hitting up one nightspot after another in celebration of their best friend's bachelorette party, a.k.a. the "stagette." And of course, it's not hard to spot the bride in the group - she's the one swaying a bit more unsteadily than the others, perhaps with a costume veil on her head and a water bottle in the shape of a certain appendage in her mouth. Maybe you've seen this scene a million times and thought, "That's disgusting - my bachelorette will be way classier than that " Or maybe you've secretly admired the fun from afar and vowed, "I can't wait until that's me "
Whatever your stagette style, here are a few tips to help ensure you get what you want out of your last big bash as a singleton, whether or not you're the one doing the planning. Plan an organized event if you don't like surprises. Still worried about what your friends may have up their stagette sleeves? Then why not plan a spa date, girls movie night, or some other sort of organized activity. 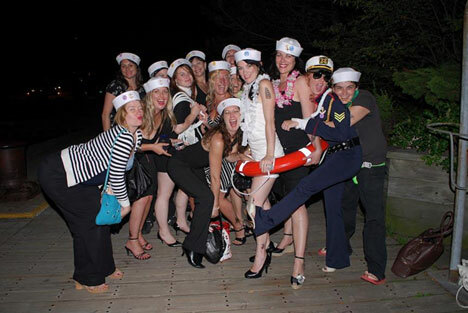 Just make sure the expenses involved for everyone aren't too onerous - chances are, the same people attending your stagette are also attending your shower and wedding, so think twice before adding that $50 per ticket harbour cruise to their wedding activities budget. Try not to mix it up in the drink department. Maybe you're one of those women with a stomach of steel when it comes to alcohol. If not, beware of the all-too-easy stomach destroyer that is mixing drinks. Even if you tend to stick to one type of alcohol on a night out, people are more likely to send complimentary drinks of different varieties to the bride, and chasing that creamy liqueur shot with a screwdriver may not end well. Don't worry about what the bachelor party is doing. If the bachelor party happens to be on the same night as your bachelorette, don't spend your time wondering what they're doing. If you're secretly steaming over the fact that your fiancee's friends hired a stripper, then that's an altogether separate issue to work out beforehand--not on the night of your stagette. Pick your battles. If your friends have something silly in store for you, remember: you won't die of embarrassment. If any surprises they happen to spring aren't hurting anyone, then chances are your friends simply want to see you let loose a little on your last night of "freedom." Bachelorette Party listings, in the Directory.